Share the dream of your wedding day with Shiralee and your vision will come to life. At your first meeting I will guide you with individual and professional attention to the colours, fabrics and your budget. I will create a truly unforgettable and world class floral design to match your wedding theme. Shiralee will personally choose each fresh bloom from her network of growers and will hand deliver to you and your venues. There is also a stunning range of accessories available to compliment your wedding flowers, bridal party, the ceremony and the reception. 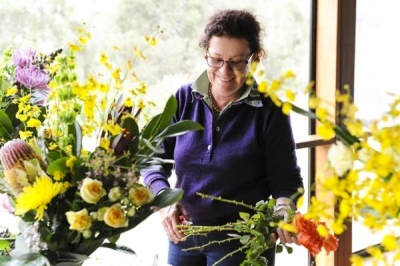 With 25 years experience in the industry including owning my own floristry business in Mudgee I now delight in specialising in the most exquisite wedding flowers for you. A true artist in floral design, I maintain the peak of my profession by attending workshops with visiting elite floral designers from Australia, America and Europe. Sunday Telegraph wedding feature Feb 2014. I live in Mudgee and have recommendations from venues throughout this picturesque region.